I get to rant about free-to-play vs subscription based games on camera for 10 minutes. Phew. And yes, it was a really, really bad hair day. It will have to come off! Runes of Magic – what to do? I’m confused. I’m not sure what to do. I’m giving Runes of Magic a proper go for a review, but I’m currently stuck in Logar trying to figure out my next move. It’s not that I don’t know where to go – I’ve already been to Varanas to pick up a second class (went for the rogue/scout combo) and I got a whole bunch of quests for the Barrows to take care of (them kobolds need to die). But the confusion comes from the fact that I’m not sure I’m on the right server or not. Runes of Magic is most certainly growing on me. It’s a pretty sweet MMO, not very high-budget but it has enough stuff to grab my attention. I’d love to get into a guild and start working on a guild hall/castle and contributing guild runes, decorate my house, sign up for the Windrunner Race and spend some money on diamonds so I can get myself a sweet warhorse to ride around on. The rogue class is fun, although pretty basic, but I’m really starting to enjoy my character. But when I look around at the players that I share Taborea with, I’m not sure that I actually want to stick around. I have a notebook next to my computer which I use to write down stuff I feel to be important while playing (thoughts on graphics, the system, the writing etc). Today I decided to start a list over the quite incredible names some people have chosen for their characters. After just 10 minutes or so, I had covered a whole page – and that’s only in Logar, Runes of Magic’s first major settlement. I’ve seen my fair share of silly names in games like World of Warcraft and EVE Online, but I’ve never seen this many during such a short amount of time. I do realise that there are a lot of young players in Runes of Magic, players that might not be allowed to have a World of Warcraft-account because of the subscription fee. Since RoM is free to play, this game is pure gold. For us older players that might actually be looking for some form of immersion (there’s that word again)…not so much. I really want to get into Runes of Magic on a deeper level than just appreciating it as a fun game, but with that kind of community, I’m not sure that I will ever be able to. Maybe I’m just sensitive, I don’t know. I did try to turn off other players’ name tags, but that doesn’t really do it for me either – even though I want to be immersed in the MMOs I play, I also like to see that I’m actually surrounded by other players. So it’s either take the pain, or just stop playing as soon as I’m done with the review – which doesn’t seem fair and isn’t really what I actually want to do. Thus the confusion. Stay on my current server (Macantacht, PvE) and try to find a guild that can shelter me from all the “Gaykillers” in Taborea (yes, I saw a warrior called “Gaykiller” yesterday) or try to find a guild on another server? If I decide to jump over to a new one, I don’t want to waste any diamonds on a character I’m going to leave behind anyway. But will another server really be any different from this one? The mage. Not a very fun class to play so far. At the same time as my download and patching of Runes of Magic was done this morning, I noticed that Beau had written a post over at Spouse Aggro about the general prejudices against f2p-games. It was a nice read since I was quite eager to give the free to play Runes of Magic a try after reading Saylah’s many posts about the game (especially the post about player owned housing and crafting). I’m a sucker for player owned housing, something most of my friends already know, and since I’m completely burned out on World of Warcraft right now (which is a post in its own right), I started up Runes of Magic with an open mind. I hoped to find a game that, although not as polished as bigger AAA-titles, would be able to charm me. I didn’t, at least I haven’t found the charm yet. I haven’t played very much of it, granted, but right from the start it felt way too much like a World of Warcraft-clone. 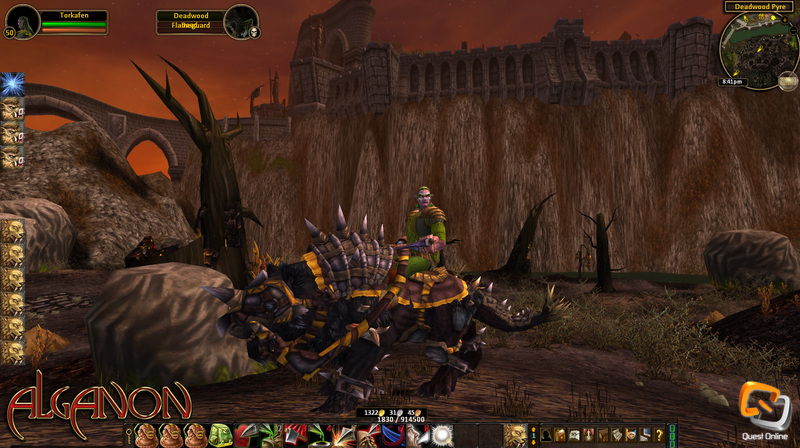 Lord of the Rings Online is similar to World of Warcraft in many ways, but it does its own thing at the same time – Runes of Magic looks like a poor man’s version of WoW. Not only is the visual design similar to World of Warcraft, so is the gameplay. So far it has nothing that would convince me to stick with it, except for getting my own house – and I might as well play Everquest II for that. I don’t mind the RMT at all, I actually think that it’s a good idea in games like Runes of Magic. What I do mind is that I can’t help feel that Runewaker and Frogster come across as quite greedy when there is no option to buy permanent pets (at this point). At first I thought that the same thing went for the mounts, but luckily it didn’t – there are both time limited mounts and permanent ones. But there is just no way that I’m going to pay real money for a pet that will disappear after 30 days. I will keep logging in now and again. After all, it is still in open beta and there’s no reason to cancel an account for a game that is free to play or to uninstall it until I need the space on my hard drive. Perhaps it will get better as time goes by (just adding in all the missing sounds would instantly make it a lot better). Perhaps rogues will get real pants. Perhaps the greatest challenge is getting through the starter areas. Perhaps the challenge is to be around players with names like “Slipknotroxx” without going crazy. First of all I need to reroll before getting deeper into the game. The mage wasn’t all that fun to play. I hope I will be able to find a class that I instantly like. If it wasn’t for the questionable fashion sense of Taborea’s female rogues, and that I’ve played one for years, I’d probably go for that. But I guess that the typical warrior/priest-combo or a more experimental class combination (warrior/scout?) might do the trick for me. We’ll see. Do I recommend you to check out Runes of Magic? Of course, it’s free and you might instantly like it. But if you are looking for a new MMO to keep you occupied until Ulduar hits the live WoW-realms, I think you should look elsewhere.